Mr. Sunil Dua is associated with TIME Institute as ‘Senior Regional Head- Academics’, has Graduated in English (hon’s) from Hansraj College, Delhi University. He has more than 24 years of hands on experience in Teaching Industry. He also has an expertise in preparing IIM select students for the GD/PI process. He has guided many students in different colleges for Campus Recruitment. He also imparts soft skill training. He first discussed the tips or pointers to keep in mind while preparing & appearing for a Personal Interview. Be it having a good night sleep a night before, reaching the interview venue half an hour before the fixed time, wishing the panelists, preparing your CV/ talk/ introduction so as you become the controller of your interview & not the panelist, so as you decide what is being asked to you. 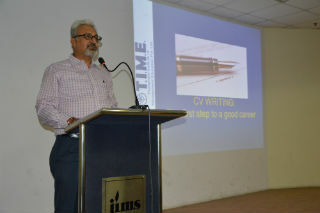 Later he discussed the Art of Resume Writing wherein he discussed the Importance of having a simple & yet structured Resume as this becomes a very important document for a Successful Career. If your resume is not good enough & does not include important details about your education, work, experience you’ll be not be able to reach the target company/ goal of your life. He also discussed the important points to include and exclude in your resume and a proper format to go about. 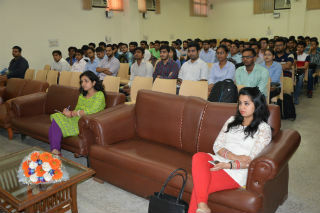 The session was very informative, useful & was well appreciated by the students.